I did this digital collage for the Water challenge at The Three Muses. A tapestry background, a vintage image with a couple of filters applied. "Bubble" photoshop brushes courtesy of easyelements.com. As soon as I thought 'water', I thought 'bubblebath'! Oh wow a bathing beauty. Really wonderful idea and great work. You made me smile really big!!! This is a lovely vintage piece. I love the bubbles. By the way, your blog header is gorgeous! Indybev, I wish I could say my blog header is my "country home" or even that I created it, but alas I can't. I've meant to do a blog post on this fab place to get free blog headers http://bannerofblessings.blogspot.com/ but haven't got around to it yet. As far as I know she just has blog headers offered for free, (she may do backgrounds for a fee), but so many of the headers blend perfectly with other backgrounds. Especially if you like the "shabby" look, she has some fantastic images! If you haven't already visited, please check her blog out! How fun! Love the bubbles! She looks like she's having a lovely time in all those bubbles. A great take on the challenge. Bravo. Beautiful vintage piece and I love the bath idea- wonderful creative work! What great interpretation of the theme! 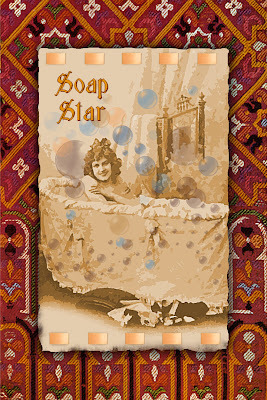 I love the bubbles, and the vintage image- the whole thing is just gorgeous! Very lovely - it reminds me of one of the old "Pears" adverts, has the same nostalgically pretty vibe! Oh I love this. Spectacular, how creative. You apologized for being late (it's never too late at the Muses) and now I am apologizing for being very late with my comment. I love your happy lady in her vintage bath - so whimsical and cheerful. Great artwork.